Happiness is Peanuts in high definition. Three beloved classics get upgraded video and audio, and bring along their DVD bonus features. The Blu-ray revolution is full upon us now, and one of the leading studios for getting out catalog product in hi-def has been Warner Bros. They have brought us lavish sets for Gone With The Wind and The Wizard Of Oz, and loaded digibook editions of King Kong and North By Northwest . So, naturally, the next item on this storied agenda was to bring the Charlie Brown TV specials to Blu-ray. 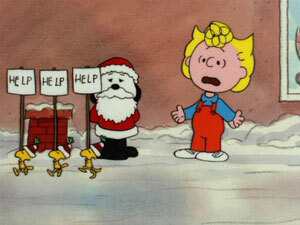 The Peanuts Christmas special was the very first for Charles Schulz’s characters, back in 1965. It was so successful in establishing a template for future specials that dozens more followed over the next few decades. 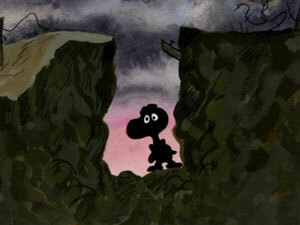 There was magic right from the start, but that start wasn’t actually the TV special that aired; it all really began a couple of years earlier when a documentary producer named Lee Mendelson decided to pursue a professional relationship with Charles Schulz. Mendelson had done a well-received documentary on Willie Mays, and decided to stick with baseball for his next subject; but this time, he wanted to profile the worst player in the world, Charlie Brown. Schulz lived not far from Mendelson in the bay area of California, and Schulz had himself seen and enjoyed the Mays documentary. This started the Schulz documentary project on the right foot, and then two more men fatefully became involved. 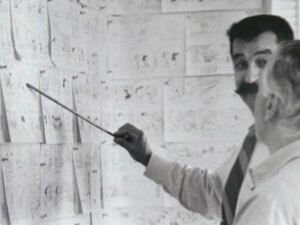 Veteran animator Bill Melendez had already been handling the Peanuts characters for a series of Ford commercials, so it was only natural that he be enlisted to provide animation for the documentary. After all, he had already done animation designs for the characters, figured out their walk cycles, and so forth. The last piece of the puzzle was Bay jazz pianist and composer Vince Guaraldi, whose music would provide the perfect accent to the struggle between the joyful and the melancholy in the strip. 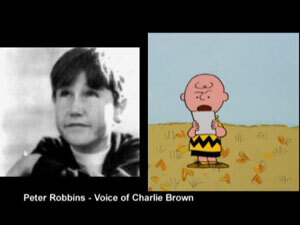 The resulting documentary was A Boy Named Charlie Brown. It was one of the most important things to ever happen to Charles Schulz and Peanuts— and yet it never aired. No network ever agreed to play it, until it was re-edited and re-formed years later. However, it did get these four men together, which prepared them for a very important phone call in 1965. Mendelson may not have sold his documentary, but it still attracted plenty of attention while he shopped it around. Coca-Cola became interested in partnering with Mendelson for a TV special, if Mendelson thought he had a Christmas special ready to go. Mendelson said he did, thinking there’d be plenty of time to come up with something. As it turned out, he was only given a few days, which led to what was probably a calm (on the outside) and desperate (on the inside) phone call to Charles Schulz. 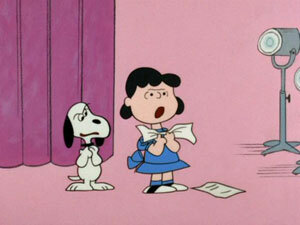 Melendez proudly informed Schulz that he had just likely sold A Charlie Brown Christmas. When Schulz asked what that was, Mendelson told him that it was what Schulz was going to write over the weekend. 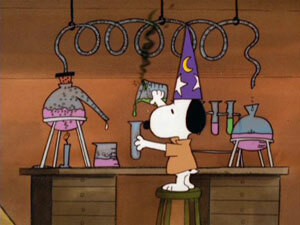 Schulz did the script, while Mendelson and Melendez also helped to shape the planned special. This was new to all of them. After all, the very first animated Christmas special had just been done in 1962, when Mr. Magoo portrayed Ebenezer Scrooge in his own special. They all had to learn the fundamentals of making an animated TV special— pacing, music, and a balance between gags and story. AND, of course, they had to capture the essence of a world-famous comic strip. The fact that they had all worked on A Boy Named Charlie Brown was a big advantage, but there was still much to be worked out. Schulz came up with a story that seemed promising, at least until the details were getting worked out. Charlie Brown, despondent that he feels only depressed during the Christmas season, confides with Linus that he doesn’t seem to understand Christmas. 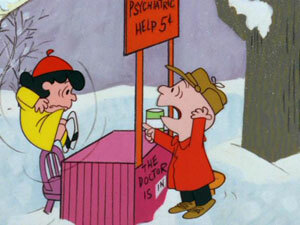 This strains even Linus’ normally understanding nature, and Charlie gets passed on to Linus’ sister Lucy, who is operating a psychiatric booth. 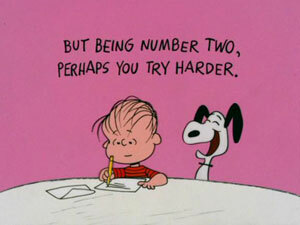 Unusually, she actually gives Charlie Brown good advice, and even an opportunity. She invites him to direct the gang’s Christmas play, the idea being that this will help him to feel more a part of things this season. This perks Charlie Brown up, but there are still things he sees that bother him. Even his dog Snoopy has fallen in with the commercialization of the holiday, as Snoopy has entered a home decorating contest that has a cash prize. Plus, his sister Sally shows only greed while Charlie helps her to write a letter to Santa. 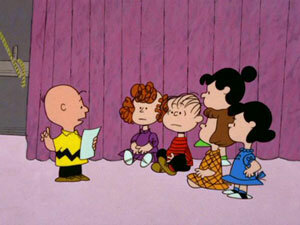 Nevertheless, Charlie Brown looks forward to directing the Christmas play. The same cannot be said for the rest of the gang, who show a definite lack of enthusiasm when Lucy reveals their new director. 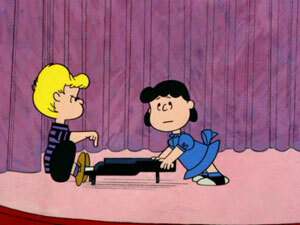 Charlie Brown has difficulty getting cooperation, and finally Lucy sends him on an errand to buy a tree with Linus in order to provide inspiration to the players. This naturally goes wrong too, as the gang feels the little tree Charlie Brown chose is too plain and small and ordinary. 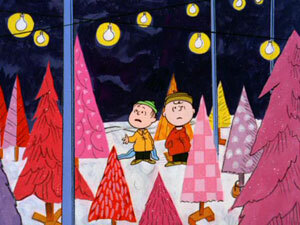 Linus intervenes by quoting the Bible story of Jesus’ birth, and suddenly everything is placed into perspective. 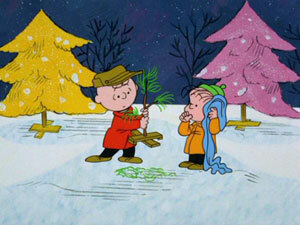 Somewhat heartened, Charlie Brown heads out into the night with his tree. With Linus’ words echoing in his head and heart, he becomes determined to not let commercialism wreck Christmas for him. Unfortunately, he has to endure just one more heartbreak, but then his friends manage to find the Christmas spirit and bring a smile to Charlie’s face. Cue spine tingle. You know, I think that I appreciate this special more every year. As much as it looks like a kids’ special, the message is probably even stronger for adults, particularly those with kids of their own. As society becomes ever more secular, the message of A Charlie Brown Christmas becomes more important. After so many showings of this special over the years, it is amazing to consider that its moral seemed so revolutionary in its day. Many involved felt that they had maybe gone too far in using biblical text in the show, not to mention criticizing modern society and reminding everyone that the holiday was really about the birth of the son of God. Fortunately, Charles Schulz insisted. Oddly, Schulz always claimed that he was never preachy in his strip, but the Christian viewpoint comes out loud and clear in both the strip and this Christmas special. And really, where would that be more appropriate than here? Aside from the classic story that we all remember, I’m amazed every year to be reminded just how deceptively great the animation is (look at Snoopy gliding on the ice in an early scene), and how many funny lines there are throughout. The good humor provides a nice counterbalance to what is otherwise a melancholy story, while suggesting the promise of a happy ending. And of course, the music is just gorgeous. I bought a soundtrack CD for this special a few years ago, and the music holds up excellently on its own. With a balanced script that evokes laughter as easily as pathos, splendid animation, charming voice performances, and superb music, A Charlie Brown Christmas is a classic all the way. With nine Peanuts specials already completed, including the Christmas and Halloween ones, it was decided that the tenth one would revisit the realm of holidays in 1973. Producers Lee Mendelson and Bill Melendez knew that they would have to do a Thanksgiving special at some point, in order to help fill out the holiday season properly. Up until then, the specials had always been largely based on sequences from the comic strip, but for this one creator Charles Schulz wrote an original story. Certainly, he was successful, as the script won an Emmy Award for Outstanding Individual Achievement in Children’s Programming. With a singular idea in mind for the special, Schulz did indeed turn in a tight script that, with a few whimsical and comical asides, told the story of Charlie Brown’s attempt to serve a Thanksgiving meal to his friends. In the story, he is somewhat forced into playing host when Peppermint Patty invites herself to his home for a holiday supper. Before Charlie Brown can explain that he won’t even be home, since his family is going to his grandmother’s house, Patty proceeds to invite Marcy and Franklin to “the big turkey party.” Charlie Brown and his sister Sally had already been fretting about the arrival of yet another holiday, seeing as how Sally hadn’t even finished off her Halloween candy yet. Now, the added anxiety of the Thanksgiving dinner is almost too much to bear. Fortunately, always-steady Linus is there to calm down Charlie Brown and offer a solution. As the Browns will not be leaving until the late afternoon, there will be time to prepare a simple meal for Charlie’s friends and to serve it before he has to go out. 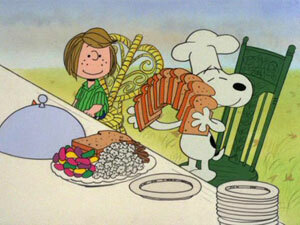 Linus enlists Snoopy to help, and they all together fix up a feast sure to please any eight-year old— or so they think. As it turns out, a meal of toast, popcorn, and candy doesn’t quite cut it, certainly not for Peppermint Patty, who lets Chuck know of her displeasure. Charlie Brown feels devastated that his friends didn’t get a proper meal, but several people come to the rescue. 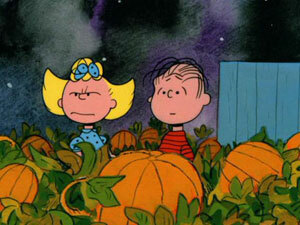 Linus and Marcy offer typically good advice, and a last-minute intervention by Grandma Brown salvages the day. Thanksgiving appears to end on a high note after all, with the gang singing together and enjoying each other’s company, thankful that they have one another. It’s a simple story, but an effective one. Phil Roman assisted Bill Melendez in directing this special. 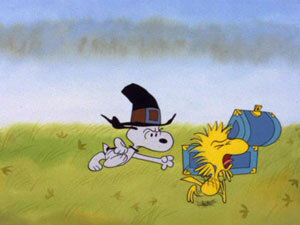 The main story is inter-cut with scenes of Snoopy fighting a lawn chair and preparing the table, and Snoopy and Woodstock dressing as pilgrims (in a scene cut from some re-broadcasts but seen in full here). 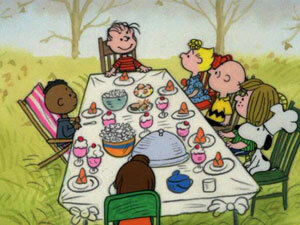 Linus, as usual, gets to sound the most erudite as he tells the story of the first Thanksgiving. The special hits all the right notes and leaves you feeling warm and happy. It was another ratings winner for CBS in 1973, and like so many other of the Peanuts specials, it has become a classic enjoyed by generations of fans. The Blu-ray editions for each special hold the same featurettes and additional specials that appeared in their DVD counterparts. A Charlie Brown Christmas: Warner paired this with the same bonus special that Paramount chose with their now out-of-print A Charlie Brown Christmas DVD. (There were actually a total of four Peanuts Christmas specials produced over the years, though one ran shorter than most, while one was an hour.) It’s Christmastime Again, Charlie Brown , which appears on this disc, was broadcast in 1992, about two months after being released as an exclusive promotional videotape at Shell gas stations. This special is the epitome of the “episodic” specials that Charlie Brown sometimes got. It includes various ruminations on the Christmas season, obviously directly adapted from the daily strip. 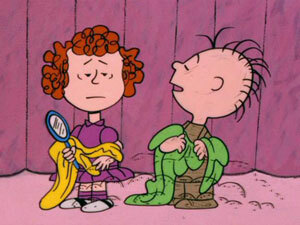 Among the many mini-plots are Charlie Brown trying to sell Christmas wreaths door to door, and planning to buy gloves for Peggy Jean, a girl he met at camp that summer. Taken as essentially replacing the reading of the strips from the newspaper, it’s quite enjoyable; just don’t expect a full story. A Christmas Miracle: The Making Of A Charlie Brown Christmas (15:57) is the requisite “Making of” featurette, following in the footsteps of the previous ones found on the Warner-produced discs. While this featurette is a keeper, it is not as rewarding as the “Making of” that aired in 2001 on ABC along with the actual special. (The earlier featurette was also included rather oddly in the Paramount DVD of I Want A Dog For Christmas, Charlie Brown.) 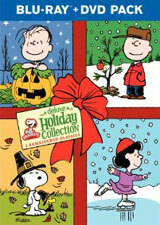 The newer version, while it does have some nice interview footage with Mendelson and Melendez, as well as Jeannie Schulz and others, totally ignores the tremendously important role of the A Boy Named Charlie Brown documentary in gathering the team that went on to do the Christmas special. It also barely acknowledges the early TV commercials, whereas the original featurette covered these things quite satisfactorily. 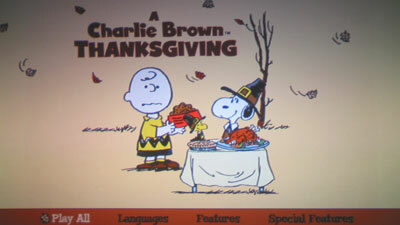 A Charlie Brown Thanksgiving: Mirroring the previous Paramount release, this disc also has the same special added as a bonus feature. In this case, it was actually part of the This Is America, Charlie Brown, miniseries, an episode entitled The Mayflower Voyages. 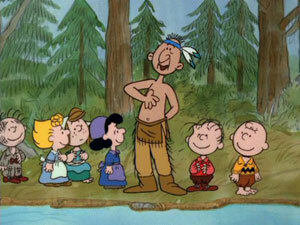 The idea of this miniseries was to place the Peanuts kids in historical settings, in order to teach history. This was one of the more effective entries, discussing some of the hard truths of the difficulties the pilgrims faced leading up to the momentous first Thanksgiving supper. This is actually this show’s third trip to DVD, as Paramount had it not only on their A Charlie Brown Thanksgiving disc, but also on a two-disc set of the miniseries (which is itself recommended). Popcorn And Jellybeans: Making A Thanksgiving Classic (12:27) again gathers all the usual participants (Mendelson & Melendez, Jeannie Schulz, Phil Roman, etc.) to discuss the making of the Thanksgiving special. 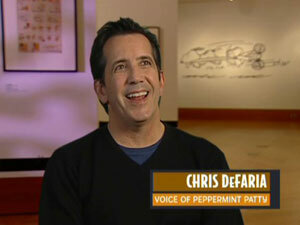 Several voice actors also appear this time around, as several of the characters were newly cast for this special. 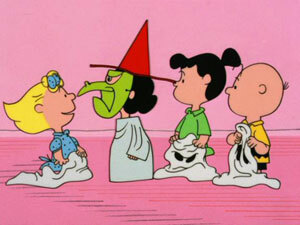 (Peppermint Patty even got a boy’s voice this time around!) Though this wasn’t the first time the “Mwa-Mwa-Mwa” adult voices are heard, the featurette does discuss how Vince Guaraldi came up with the idea for using a trombone to take the place of the off-screen adults’ lines. Finally, the participants address the oddness of Snoopy and Woodstock— a bird, obviously— eating turkey at the end of the special. The Christmas Blu-ray also has trailers for the Peanuts discs, and another for other Christmas DVDs, both oddly presented in 720p; plus a Charlie And Lola DVD ad in 480p. The other Blu-rays simply go straight to the man menu, with no trailers available. Each BD + DVD set comes in its own Blu-ray keepcase, same as the standard retail versions for each one. The three keepcases come in a slipcase that is a Blu-ray sized duplicate of the DVD version, looking sharp with the red foil of a ribbon design, along with the blue foil of the Blu-ray logo. The Blu-ray and DVD discs carry the same artwork (so look for the BD/DVD logos), with the Blu-rays being on the left side of the case, and the DVD on the right. This set does not have the music CD that appeared in the DVD version. It also does not have the slipcovers for the individual cases, as they had when initially sold individually. But, this set does have a 50-cent coupon for frozen pretzels! I kid you not. What you are all really wondering is whether it is worthwhile seeing these TV specials on Blu-ray, right? The answer is a weak yes. After doing numerous comparisons, toggling back and forth (using two upscaling, hi-def players playing on my 51” screen), I found there were many instances where there was no appreciable difference; but there were also frequent instances where the Blu-ray image was noticeably sharper. I’ve seen other reviews proclaim that “you can see the individual brushstrokes!”, but I can see that on the DVDs too. To me, the biggest difference is the distinctness of the outlines, which can look a trifle blurred in standard def, but are nice and clean in hi-def. In motion, there is still very little difference to be appreciated, but there is enough to bear saying so. Overall, I would not say that the video quality makes an upgrade worthwhile. The animation style used in the specials simply does not lend itself to an overwhelming hi-def impression. The specials, of course, have been digitally remastered in a very pleasing way, leaving just enough grain to prevent artificiality from creeping in, but still giving us the cleanest representation of these specials we’re likely to see. The bonus specials fare even better, generally, given that they are newer. A much bigger difference comes with the audio. All the specials (including the bonus ones) have been given 5.1 upgrades over the original one-channel mono. While the 5.1 can get gimmicky at times, when center effects suddenly come from a corner speaker, the gain in ambience with Guaraldi’s music makes it all worthwhile. A chief reason for watching these specials every year is to bask in the awesomeness of the music, and it’s great to hear it spread out over all the speakers, drawing you more into the world of Charlie Brown and the gang. Of course, these recordings do have their limitations, with the 1960s specials still sounding slightly muffled with their dialogue. Now the bad news: The iconic Christmas special was given short shrift, getting only a lossy Dolby Digital track, rather than the lossless sound of DTS-HD Master Audio found on the other two discs. This is a somewhat astonishing oversight. While A Charlie Brown Christmas still sounds good, the lossless sound afforded the other Blu-rays is certainly better yet. Of all the specials to screw up, why the Christmas one?! It’s a shame. You can’t beat these specials, certainly, and if you don’t love them then I can’t vouch that you have a soul. So, the question becomes whether you need to have these in high definition. The video upgrade is present, but it is relatively insignificant. The audio is a bigger improvement, and lovers of the Guaraldi music in particular may wish to consider an upgrade for that reason alone. Still, it’s a hard sell if you already have the DVD versions, particularly considering the botched inclusion of only a Dolby Digital mix for the Christmas disc. However, if you don’t already have Warner’s remastered DVDs, then this is certainly the version to go for. With the DVDs also included, even non-owners of Blu-ray can future-proof themselves with this set.